Few weeks ago somebody uploaded a video to Youtube, with this description "Video (from original VHS) used at the launch of the Enterprise at the Plasterers Hall, London on 14th September 1983"
Now after your informations I think this video is more later. Do you ever seen this video? Any idea for the right date? Interesting...that seems to be the the event your earlier poster refers to at Plaisterers Hall. I don't think that's the "launch" I'm thinking of. The software there looks more finished than the one I remember! I'm pretty sure the event I'm thinking of was at the London Hippodrome http://en.wikipedia.org/wiki/Hippodrome,_London (now a casino) because it was within walking distance of our office in Bedford Square, London, and we all walked down, looking so scruffy having been up all night that the door men would not let us in at first! Wikipedia says "Renovated yet again, the building was reopened as a nightclub/restaurant called "The London Hippodrome" by nightclub tycoon Peter Stringfellow in 1983" and it did feel nightclub-ish. And I think it would have still been called the Elan Enterprise then. I've just been reading that article in Your Computer Jan 1984 that contains the photo taken at the event I am thinking of. It says "From the outside the Elan Enterprise looked complete by the beginning of September and it was time for the press launch which went smoothly - apart from the crisis caused by the late arrival of the rubber membranes [for the keyboard]." ... "But although the case and the hardware inside were ready at the launch there was a limit to what could be demonstrated beyond the range of colours available on screen and how smoothly they could be scrolled. The Basic, which has taken two years to write to try to meet the specifications of the American National Standards Institute, was running on other machines but had not yet been implemented on the Elan." ... "Elan expects to have Forth, Lisp and assembler available when the Enterprise is launched"
So it sounds like there were two launches! The "Your Computer" launch that I remember, and a later one of the invitation and video. We know the later one was on 14th September 1983 but I haven't managed to pin down the date of the earlier one - it can't have been that much earlier as Your Computer was Jan 1984 (remembering magazines are usually published the month before the title, so it would have been available in shops in December 1983). that seems to be the the event your earlier poster refers to at Plaisterers Hall. That is talking about a banquet. Probably the launch with the technical demonstration is in the Hippodrome as you remember and then a banquet for a selected guests in the Plaisterers Hall? The software there looks more finished than the one I remember! Yes the softwares (Cyruss Chess, Starstrike 3D, Jack's House of cards, Hisoft GEN-MON, Happy Numbers) looks like the known final versions. We known these with 1984-85 release years. Therefore suspect that this is more later video than your launch. It is also suspected no ELAN name in the video. most of us had been working through the night! This is a special case or happened it many times during the Enterprise project? Totally about how many work hours in the IS-BASIC, EXOS, EXDOS, etc? It happened a few times before deadlines etc but not too often, thankfully! Our working ours were very flexible though - no set start or finish time. Usually we started mid morning and went on well into the evening. There were night buses in London at the time (probably still are) and I often caught the 2:30am night bus home. We worked well over the minimum 40-hour week, and I certainly did a 100-hour week more than once. Although it was "work" I think we all enjoyed it - I said at the time I would have done it even if I wasn't being paid for it (and we were paid well). I couldn't begin to guess the total number of hours in the sw! It would have been complicated by the fact that not only did it have to be written, it had to fit in the available ROM space, and I spent quite a lot of time re-writing already working code just to make it a bit smaller. This is what we always feel when using or programing the Enterprise computer! This machine is made with heart and soul! not only did it have to be written, it had to fit in the available ROM space, and I spent quite a lot of time re-writing already working code just to make it a bit smaller. I'm working on the EXDOS disassembly (I hope you don't mind) and found many tricks of these, and very enjoyed it!
! Wow! Good luck! I wish I could remember more detail to help you but it was sooo long ago! That is very sharp eyed of you ! And is another thing I had forgotten! EROS (Elan Rom Operating System) was a name we (the developers) chose following a long tradition of naming the computer OS after Greek mythology. It was the Enterprise marketing men who demanded it was changed to EXOS (Enterprise eXtendable Operating System). I suppose they can be forgiven for being a bit nervous about naming! I am amazed to find the Enterprise still living on! How did you find our forum? And before finding us what do you know about the life of the Enterprise after the UK companies are closed? Very good question. I'm also curious about this. 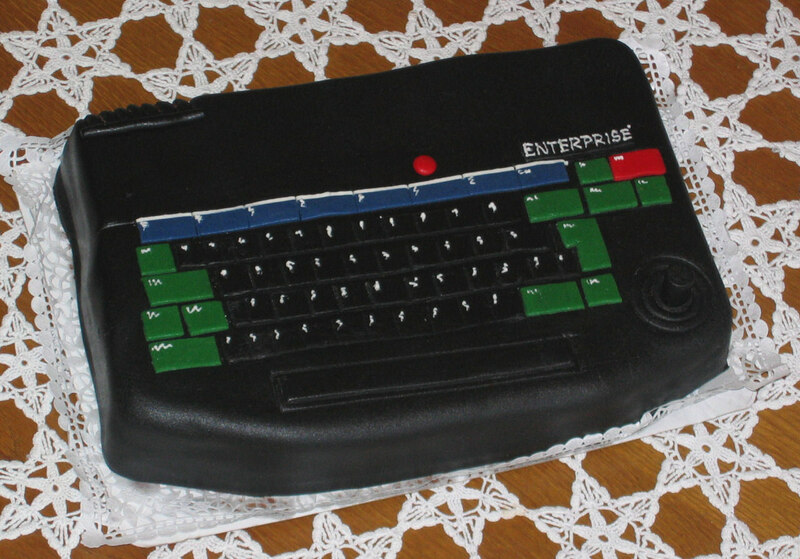 Because Intelligent Software was separate from Enterprise Computers, I actually knew surprisingly little about what Enterprise Computers did. In fact it was some years after their collapse that I heard that it had become popular in Hungary. I read somewhere (possibly here!) just a few days ago that after the collapse the remaining 20,000 units were shipped to Hungary - that was news to me! I'm still confused about how Germany fits in with this - there seem to be German Enterprises around with German keyboard layouts (slightly different to the normal UK layout) and translated German software. I found your forum just by google. I just wondered one day if any Enterprises ever came up on eBay (and was very surprised at the prices they fetched!). So then I did some more googling and found wikipedia had an entry for the Enterprise, which also surprised me, and found your wonderful forum which surprised me even more! I use google's Chrome browser under Windows which has an auto-translate feature, which was very useful! I heard that it had become popular in Hungary. I'm still confused about how Germany fits in with this - there seem to be German Enterprises around with German keyboard layouts (slightly different to the normal UK layout) and translated German software.